Sometimes I wish my family didn't like bananas so much. I rarely have any around to make banana bread with because they get eaten so quickly. Yes, I realize that I’m complaining about the fact that my onions actually like to eat fruit. Yes, I realize that sounds ridiculous. But I wanted some dang banana bread. Bad. So, I hid the bananas until they were overripe. Oh, pooh, are these too ripe to eat? Well, I guess I’ll just have to make banana bread! 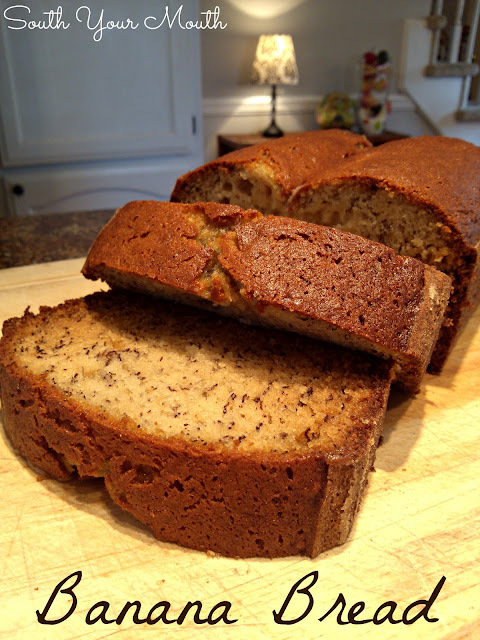 I’m usually all about short-cut recipes that use semi-prepared ingredients and mixes because I barely have enough time in the day to brush my teeth but my banana bread recipe is so easy that even I have time to make it from scratch. This isn't a fussy recipe where you have to alternate the wet and dry ingredients, sift anything, combine anything in separate bowls, etc. You just mix it all up, throw it in a pan and an hour later you’re eating homemade banana bread. Oh, and if you get down to the last hunk of it and it’s not as fresh and wonderful as the day you made it, you should totally make French toast with it, smear it with a little peanut butter (which will get melty and wonderful) then top it with fresh sliced bananas, walnuts and syrup. It’s over-the-top indulgent but it is so gooooood, y’all! Peel and slice bananas then add to a medium-sized mixing bowl. Using an electric mixer on low, beat bananas until creamy and only small chunks remain. Add oil, eggs, vanilla extract and sugar then continue beating on low until well combined. Add flour and baking soda and continue beating on low for 1-2 minutes or until batter is evenly combined. Grease and flour a standard-size loaf pan. Pour batter into prepared pan then bake at 350 degrees for one hour or until toothpick inserted in the middle comes out clean. Cool banana bread in pan for 20 minutes then turn out and serve. Store at room temperature in an airtight container. Like the new look and love your recipes! where is the recipe for the shrimp in the picture? I've only recently found you via FB and you've become a solid favorite. Keep up the good work! That's about the best thing anyone's said to me all day! Thanks, friend! The food pics look so yummy and the new look to your site is very fresh and original. I like it! It is in the oven; smells absolutely wonderful. Cannot wait to try! Thank you for posting this recipe. Mine turned out raw on the inside! What did I do! ?